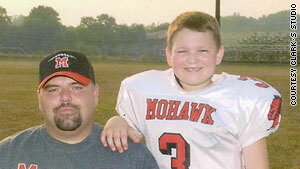 Jordan Brown, shown with his father, will be tried as an adult even though he is 12. (CNN) -- A judge in Pennsylvania has denied a request from a 12-year-old homicide suspect to have his case transferred to juvenile court. Jordan Brown is facing adult charges in the February 2009 shooting death of his father's pregnant girlfriend, and a judge turned down a petition to have the case transferred from criminal to juvenile court. Police have said the boy, then 11, shot Kenzie Marie Houk, who was eight months' pregnant, once at point-blank range in her farmhouse in western Pennsylvania. He has been charged with one count each of criminal homicide and homicide of an unborn child in the death of Houk, 26, Lawrence County District Attorney John Bongivengo said. Houk's 4-year-old daughter found her mother in her bed, according to police. The child alerted landscapers working near the home, who then called authorities. "This is something that you wouldn't even think of in your worst nightmare, that you'd have to charge an 11-year-old with homicide," Bongivengo told CNN affiliate WTAE-TV in Pittsburgh at the time of the killing. "It's heinous, the whole situation." Under Pennsylvania law, anyone over 10 accused of murder or homicide is charged as an adult. If convicted, the boy faces a maximum sentence of life in prison, Bongivengo said. Authorities said the boy is the son of the victim's live-in boyfriend at the home in Wampum, about 35 miles northwest of Pittsburgh. "At this point, we don't believe it's accidental," Bongivengo said. The weapon was a youth model 20-gauge shotgun, designed for use by children, that belonged to the boy, according to investigators.